Take an off from work and plan a movie this Valentine week. Book your tickets with Bookmyshow to watch the upcoming entertaining movies. 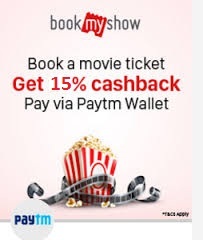 Paytm is currently offering 15% cashback on online movie tickets at Bookmyshow. Enjoy your favorite movies with popcorns & softdrinks and save your money using Paytm wallet to avail cashback. Hurry !! offer is valid for limited period only. How to steal the deal ? Visit here to get offer page. Select your movie and venue as per your location. Proceed to make payment using Paytm wallet. You will get 15% cashback in your Paytm account. Offer will expire on 29th Feb 2016. Applicable only for Paytm Users making payment through their Paytm wallet. Maximum cashback is upto Rs.50 only. Applicable on Web booking and App booking as well. Cashback can be further used for recharge or other services.